Background: Several healthcare organisations strongly recommend aspirin usage for high-risk patients to prevent cardiovascular disease. 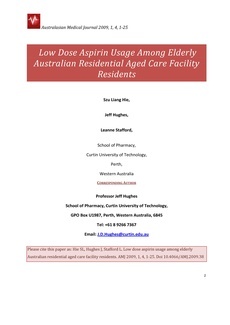 This study retrospectively audited the usage of aspirin as an antiplatelet agent in two cohorts of Australian residential aged care facility (RACF) residents in the Perth, Western Australia (WA) and Sydney, New South Wales (NSW) metropolitan and surrounding areas. The primary objective was to compare the appropriateness of current practice regarding aspirin usage with the National Heart Foundation of Australia (NHF) guidelines. The secondary objective was to identify predictors of aspirin usage and non-usage to permit targeting of ‘at risk’ groups. Methods: Data on aspirin usage, resident demographics, concurrent drug use and disease states, especially those representing potential predictors of aspirin usage or non-usage, were recorded. Data analysis was performed using independent samples t-testing, ÷2 testing and univariate and multivariate logistic regression analysis. Results: Rates of aspirin use were 35.2% and 32.5% in the WA and NSW cohorts, respectively, with no difference between the two groups (p=0.476). Common aspirin dosages were 100mg and 150mg daily. Aspirin prescribing rates for indicated cardiovascular conditions varied from 23.1% to 47.1% in the WA residents. Multivariate logistic regression analyses on the combined data demonstrated male gender (OR=1.46, 95% CI: 1.06-2.01) and concurrent usage of angiotensin receptor blockers (OR=1.61, 95% CI: 1.06-2.45), angiotensin converting enzyme inhibitors (OR=1.78, 95% CI: 1.28-2.46), beta-blockers (OR=1.99, 95% CI: 1.38-2.85), antihyperlipidemics (OR=1.62, 95% CI: 1.14-2.31) and antiarrhythmics (OR=1.57, 95% CI: 1.02-2.41) to be predictors of aspirin usage. Predictors of aspirin non-usage were clopidogrel (OR=0.28, 95% CI: 0.15-0.51) and warfarin usage (OR=0.09, 95% CI: 0.03-0.24). Conclusions: Suboptimal aspirin usage was demonstrated among both cohorts of RACF residents in spite of strong recommendations from national guidelines. Various predictors of aspirin usage and non-usage were identified. Significant efforts should be made to encourage aspirin usage in the elderly ‘at risk’ population.